Want to Make Easter Even More Magical? Click me! 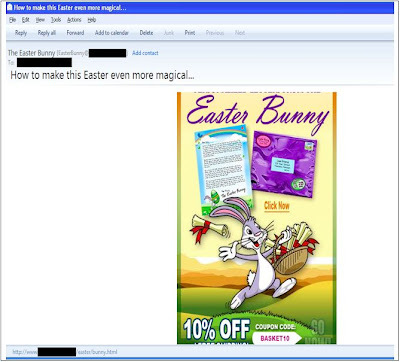 As Easter approaches, spam related to this upcoming holiday is expected. Spammers didn’t send malicious greetings like last year—they sent out various product promotion ads instead. One particular coupon promotion page offers recipients a free coupon for digital TV service for Easter. A domain attack was observed from this spam attack, and the offer page changed to different product coupons on a daily basis. 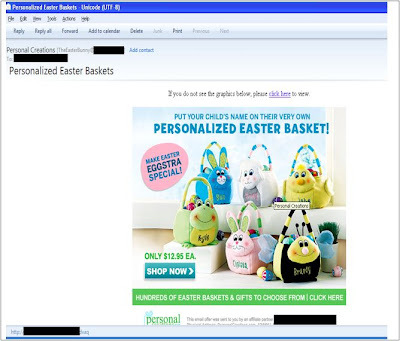 In another Easter spam message we observed a gift basket promo message that is just like ordinary hit-and-run spam, in which the spammers try to bypass spam filters by changing the registered domains while using the same promotional ads. Spam filters can often miss this type of sudden increase in volume mailing.